SACRAMENTO (California) – Media events such as these don’t come around very often. 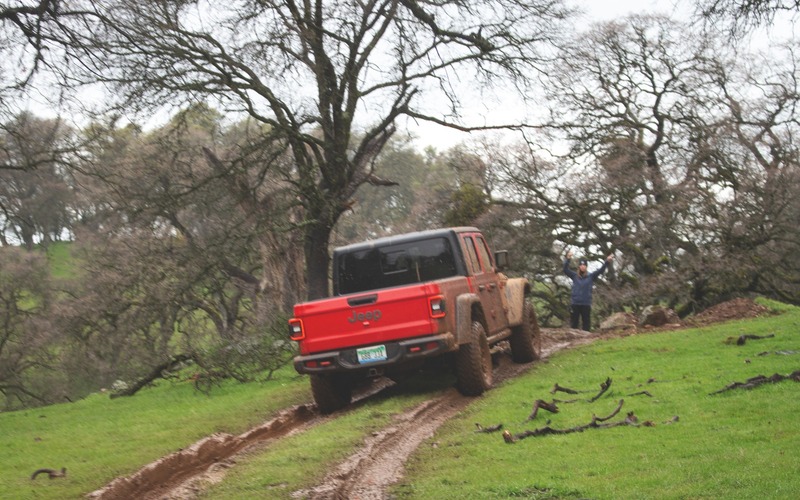 After a brief conference from one of FCA’s spokespeople, the planning of the day was concise and straightforward: head out into the mud to test out the off-road capability of Jeep’s all-new pickup truck. No problem! Yes, the 2020 Jeep Gladiator is a big and expensive toy. Heck, even FCA admits its fuel consumption isn’t the best in the segment. But that doesn’t prevent it from being spectacular. Up until now, the basic formula for a midsize truck was rather simple: a body-on frame construction, more than ample towing capability, and four-wheel drive to get you out of trouble. We give the Honda Ridgeline credit for attempting to innovate the segment with its unibody construction, and it’s a frankly excellent machine. So good in fact, that we gave it our Best Buy award for 2019. But moving forward, things might change, because the Gladiator redefined our midsize truck expectations. We’ll resume it using three important keywords: Jeep, pickup, and convertible. It’s a recipe that should give its competition a hard time. Indeed, the Gladiator runs on a Wrangler platform, but everything from the B pillar rearwards was re-engineered. Its wheelbase was stretched by a whopping 19 inches (482 mm), and its frame is 31 inches (787 mm) longer overall, making it the longest “small” truck in the segment. Its entire structure was reinforced, front and rear tracks were slightly widened, and the brakes now get ventilated discs to cope with towing realities. Heck, the Gladiator even gets the same suspension control arms as the Ram 1500. FCA didn’t mess around. What’s more, towing capacity is up there among the top of the segment. FCA claims 7,650 lbs. (3,470 kg) once equipped with the appropriate tow package, placing the Gladiator right smack between a Ford Ranger (7,500 lbs. / 3,401 kg) and the Chevrolet Colorado/GMC Canyon (7,700 lbs. / 3,493 kg). Max payload is rated at 1,600 lbs. (725 kg). All Gladiators come with four doors and a five-foot box. And being a Jeep means that, yes, the Gladiator can remove its roof, doors and windshield, a feature no other pickup truck currently offers. When it’ll hit dealerships this summer, one engine will be available; FCA’s ubiquitous 3.6-litre Pentastar V6. 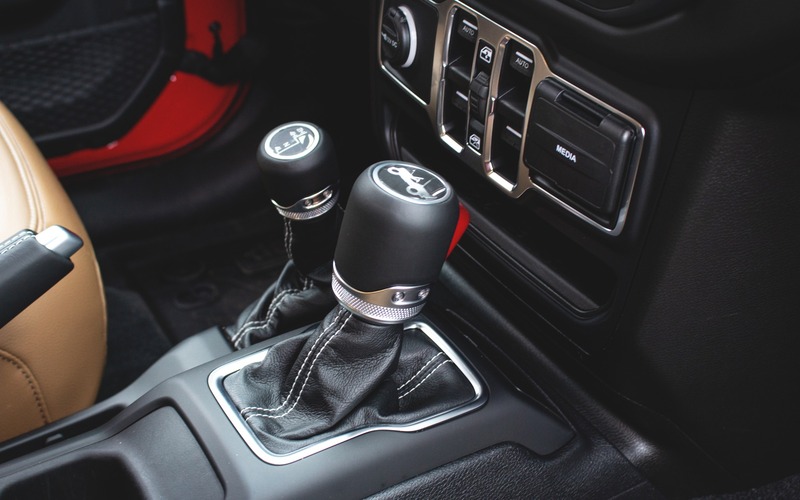 It’s good here for 285 horsepower and 260 lb.-ft. of torque, and comes mated, as standard, to a six-speed manual gearbox across the model range. An eight-speed automatic transmission is optional for roughly $1,500 extra. Next year, a 3.0-litre EcoDiesel V6 will join the party, promising 260 horsepower and a lofty 442 lb.-ft. of torque. Of course, all Gladiators come standard with a two-speed four-wheel drive system. 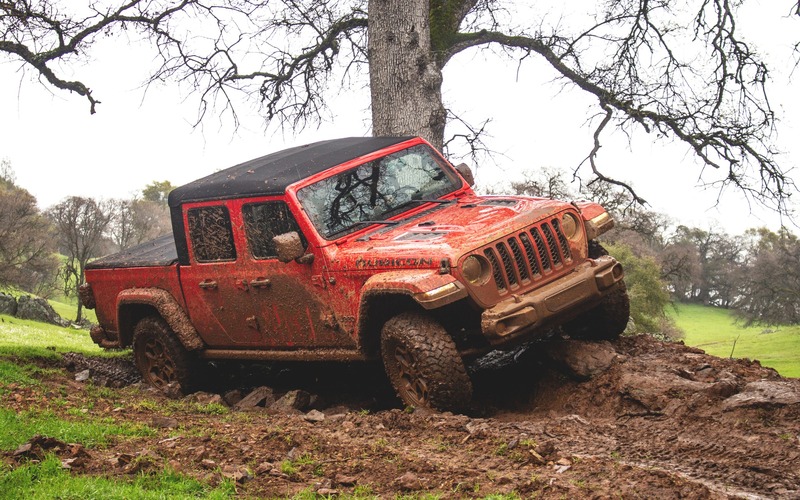 And like the Wrangler, the Rubicon trim comes with removable sway bars, Dana 44 axles with locking differentials, a lifted suspension, 33-inch tires, skid plates, a very witty off-road camera fitted with a sprinkler to clean it, as well as tow hooks. Fun fact: most Wrangler Mopar accessories fit on a Gladiator, which means if you already own a Jeep, you won’t need to buy new parts for your truck. Three trim levels are offered: Gladiator S, Overland, and Rubicon, each selling for $45,495, $49,495 and $52,495 respectively. That’s before freight and destination. On the road, the longer wheelbase and suspension setup are instantly felt as the Gladiator’s ride is much smoother and refined than its sibling. That said, while chassis wobble and swaying have been toned down, the Gladiator’s driving dynamics remain rudimentary when compared a Ranger, a Colorado/Canyon, or a Ridgeline. It more or less drives like a Tacoma, feeling like it’s from an entirely different era. And don’t get us started on the enormous amount of play in the steering wheel. But the Gladiator is a much more comfortable place to spend some time in than its main Japanese rival. As a matter of fact, except for perhaps a Ridgeline, its cabin is considerably more spacious and comfortable than its rivals, not mentioning one of the most interesting dashboard designs on the market. Ergonomics are also a Gladiator strongpoint, where all controls, both physical and haptic, are easy to grasp and comprehend. As always, we congratulate FCA’s Uconnect infotainment interface for being so solid. The V6 engine pulls strong, offers plenty of low-end grunt, and even sounds alright the moment you gun the throttle, providing more than ample acceleration for a truck of this size and weight. And we have nothing to say about the manual gearbox. It’s precise, enjoyable to row through the gears—a net improvement over past Jeep transmissions—with a light clutch and firm friction point. The calibration of the ZF-sourced automatic impressed us as well, but it’s a tad sloppy during towing, sometimes hunting for gears, brutally downshifting without notice. We did appreciate the fact that it automatically detects the presence of a trailer, though, with no in-car configuration required. What the Gladiator loses in sophistication, it makes up for in off-road capability. 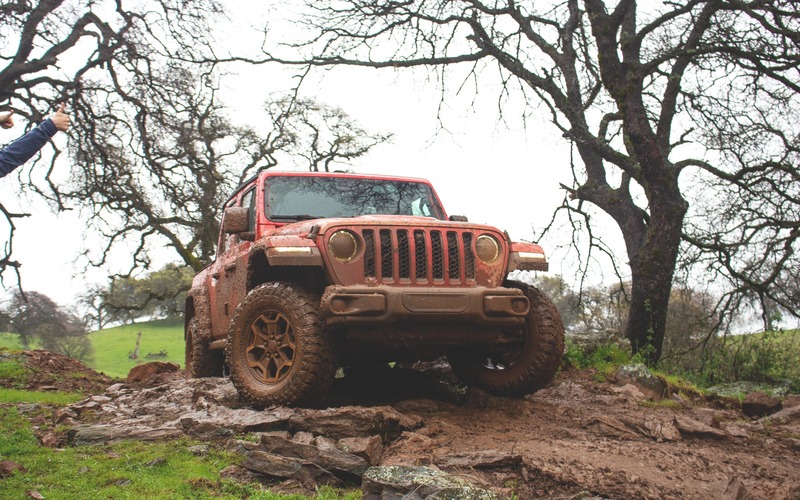 Even in base trim, it’s a genuine adventure machine that was tested on the gruelling trails of the Rubicon. Sure, its longer wheelbase does remove a bit of its agility in the rocks, but with a 40.8-degree approach angle, and a 25-degree departure angle, the Gladiator has a net advantage on its rivals. 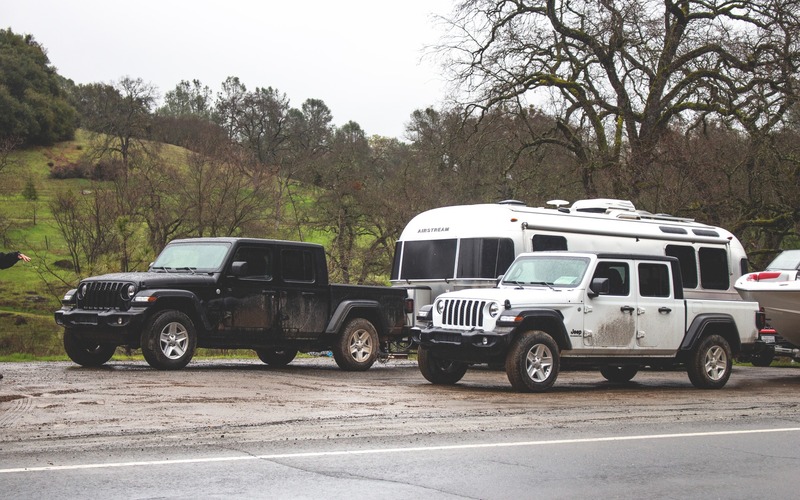 Except for perhaps a Tacoma TRD Pro, or a Colorado ZR2, we fear none of the Gladiator’s rivals could have followed us in the off-road course FCA had prepared for us. Rocks, grut, mud, rain, and sometimes scary declines (we were at a 35-degree angle at some point! )—we were exposed to everything mother nature and the off-road course could throw at us. Simply put, no other midsize truck on the market can do so much straight out of the box. That’s because the Gladiator is a Jeep. And that’s when we realized how accomplished the formula is, because it’s so unique. Granted, this being an FCA product, we ignore if the Gladiator will be a reliable truck. And our tester was plagued with a bizarre water infiltration issue at the base of its windshield. Worrying, to say the least. But hey, we were driving preproduction models, let’s hope these glitches are fixed by the time the trucks go on sale. 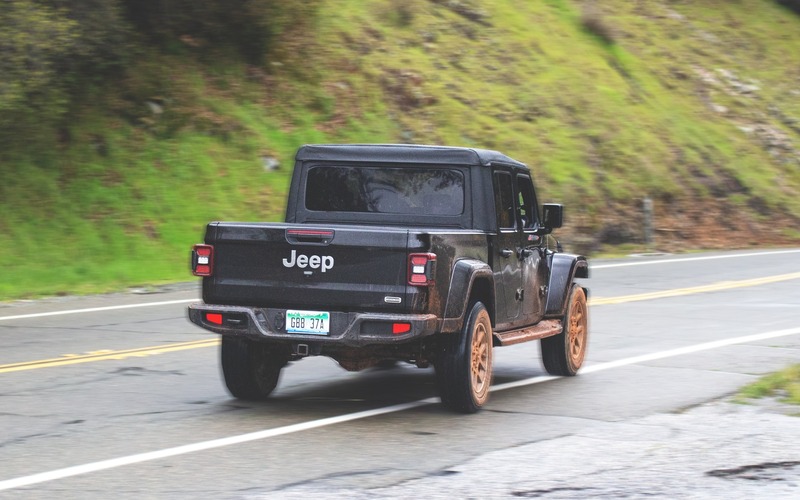 There’s absolutely nothing logical about the 2020 Jeep Gladiator. But it’s plain out cool and desirable, and that makes us smile. It also happens to be a frankly capable truck, all while leaving intact the endearing Jeep qualities we love so much. From our point of view, that’s a win for everyone. 6/10	During our drive, we averaged 11 L/100 km, which is ok, but not great. 8/10	While the soft top does lead to a fair bit of wind noise, the Gladiator’s cabin is roomy and comfortable, both front and rear. 10/10	The V6 engine provides more than ample acceleration for this type of vehicle. 10/10	FCA’s Uconnect interface is among the best in the industry. It’s simple, user-friendly and quick to react. We appreciate the redundant physical controls, as well as the most recent connectivity features. 8/10	There’s nothing sporty about the way the Gladiator drives. It bounces and wobbles over rough roads. But it’s still a hoot to drive. 8/10	Unique and surprisingly capable, the Jeep Gladiator may be an expensive toy, but it’s cool, desirable, and above all, still a Jeep.